My first visit to Nanjing was in 1989, and since then I’ve visited the city at least a dozen times. Yet over the past few months I’ve gotten to know the city better than ever. And I’m finding I’m liking it more and more with each visit. This past weekend I accompanied my daughter Sarah to Nanjing, the capital city of Jiangsu Province and the former Southern Capital of China, where she took part in a debate competition along with a few hundred other students from the surrounding region. While Sarah and her partner Grace were busy debating with the other teams, I took advantage of my two- day stay to explore the city some more. Like I said I have been to Nanjing many times in the past and have visited some of the most famous sites, such as Zhonghua Gate, Qixia Temple, the Nanjing Massacre Memorial, and of course, the Sun Yat-sen Mausoleum. This time I managed to visit a few important places I hadn’t been to before, or else hadn’t been to in many many years, including the Linggu Temple 灵谷寺 and the Ming First Emperor’s Mausoleum 明孝陵. I also spent a morning at the Nanjing Museum, which I believe was my first time there. In addition I walked extensively around the center of the city and in the area of the Drum Tower, clocking over 18,000 steps or 15k in one day. My overall impression is that Nanjing offers up a very nice combination of traditional features and rich historical culture along with an increasingly cosmopolitan and globalizing environment, and the city seems to strike a nice balance between the two. My previous visit to Nanjing was work-related—not to my core job at DKU, but my “second career” as a documentary TV host. This is a long story which I will save for another post; suffice it to say that I was hired by Jiangsu TV last year to host a series of shows about several foreigners who came to the aid of Chinese people during the horrifying event known as the Nanjing Massacre of 1937. During that short and intense filming stint, which took place mainly over the October holiday week, we filmed at many famous places. One of the first items on my agenda was to pick up the set of DVDs that the Jiangsu TV station had produced, which had been left for me at a hotel near the Drum Tower. On the way over, I stopped in for a brief visit at the Drum Tower Hospital, which was a big part of the story occupying one of the episodes. Afterwards, I paid a brief visit to the Drum Tower, which has a nice exhibition of old Nanjing city photos inside the tower. I then strolled around that area, which is dominated by the tallest building in Nanjing, and then headed by didi (Chinese Uber) to Zhong Shan mountain on the city’s eastern edge, where the Linggu Temple is located along with the Sun Yat-sen Mausoleum and other famous sites. For 100 RMB I bought an entrance ticket to the park that included several sites, and spent the rest of the afternoon walking around to each one. These included the impressive Wuliang Palace, which features an exhibition dedicated to the Revolution of 1912, and also the tall Linggu Pagoda 灵骨塔 built for the Soldiers killed during the Nationalist Revolution, which after climbing nine or ten floors offers a stunning view of the surrounding forest-covered mountainside. One of the other features of this park is the birdsong, which is everywhere and quite beautiful to hear. Linggu Temple itself struck me as a bit underwhelming, if only because I’ve been to so many Chinese Buddhist temples recently, and it felt a bit stilted in comparison with Qixia temple 栖霞寺 to the northeast of Nanjing or the Tiantong Chan 天童禅寺 Temple in Ningbo. Perhaps this is because it’s located in a major tourist area. Still it was worth the visit, and the Buddhist icons are splendiferous. After walking around that area of the mountain, I took a bus over to the Mausoleum of the First Ming Emperor. On the bus, a young man from Henan struck up a conversation with me in English, telling me he had little opportunity to practice his English in Zhengzhou. I was more than happy to oblige him. Having taken many tours of the Ming Tombs in the hills north of Beijing, it was interesting to compare the Ming founder Zhu Yuanzhang’s mausoleum to those of his progeny. The ancestral worship hall was destroyed long ago and the one they built in its place is once again quite underwhelming compared to what the original must have been like—but at least you can see the foundations for the pillars and get a sense of how grand it once was. On the other hand, the tower in front of the tomb mound is very impressive in its grandeur. Inside the tower is an exhibition of the layouts of all the Ming tombs along with some information about each one. After visiting the Emperor’s tomb, I paused for a rest and some delicious guihua gao (pounded rice cake with cassowary), and then walked down the Sacred Path to the entrance gate. There I confounded the locals who were waiting to take us rubes back to the city with their hefty taxi fees, and ordered a didi. One taxi hawker kept circling me like a buzzard, taunting me in his limited English, and it was with great satisfaction that I waved him goodbye when my didi finally arrived. So instead of paying 80 or 100 RMB which is what they try to charge tourists, it only cost me 13 RMB to get back to the Drum Tower area in the didi. The following morning, I took the number 2 subway from our hotel over to the neighborhood of the Nanjing Museum 南京博物院. I must admit it took some effort to find the entrance where I could buy a ticket, and then some more to find the booth where they sell tickets to foreigners. This is not because they don’t want to encourage foreign guests—although perhaps there is still some residual fear after all the plundering we did of Chinese treasures over the past two centuries. The fact is that it’s often more challenging for foreigners to buy tickets here in China because they have all these automated systems now for Chinese nationals to purchase tickets using their IDs, but they don’t work in the case of foreign passports. Anyhow, after visiting two or three halls and standing in some wrong lines, I finally found the spot where I could buy a ticket and found myself in the historical section of the museum, where I spent a hurried hour rushing through the exhibitions in order to get an overall sense of the historical narrative of the museum and what it’s greatest treasures were. Unfortunately many of the greatest treasures of this museum which opened in 1933 were hauled away by the KMT, so you have to go to Taipei to see them. Still, there are plenty of exquisite treasures to see in this museum, and here are some of the highlights. The museum basically tells the story of ancient China’s growth and development from the local perspective, highlighting the rich cultural heritage of the Jiangnan Region. Some of the highlights include scale models of the traditional cities of Yangzhou, Suzhou, and of course, Nanjing. Some of the great masters of painting, such as Dong Qichang and the Four Wangs of late Ming-early Qing period are also featured in this hall. And there were many items I’d never laid eyes on before, ornamental decorations, arches, and exquisite artworks made out of bricks depicting dragons and the Seven Sages of the Bamboo Grove 竹林七贤 from the Six Dynasties 六朝 era. After visiting the museum, I returned just in time to see my daughter compete in the final round of the debate competition, where she and her partner earned a respectable second place, though some in the audience would have pegged them for first place. After the usual scramble through the Nanjing Station, we are now comfortably seated in the high-speed train bound for Shanghai—a two hour trip which back in the old days would have taken an entire day to complete, and even a few years ago would have been at least double that time. I feel that every time I visit Nanjing I gain a deeper understanding of its important and unique place in the history of China and see more of its cultural and historical treasures. At the same time Nanjing is a pretty comfortable place to be, somewhere between the decadent grandeur of Beijing and the fast-moving international business environment of Shanghai. Like Beijing, its stately avenues are meant as much to inspire awe as move traffic, and the plane trees lining its streets are much taller and grander than those of Shanghai’s French Concession. Like Shanghai, Nanjing now has its share of shopping malls and I even noticed that the Blue Frog and Element Fresh restaurant chains of Shanghai have invaded that city as well. Still, even though Sarah and I enjoyed a meal in each, it was nice to join Grace’s parents for a good old Nanjing-style meal with some BBQ’d lamb and roast duck. Unlike both of the other Chinese cities that I know and love so well, Nanjing also has a unique combination of rivers, lakes, and mountains that make it the hands-down winner in the natural beauty competition. Beijing has the mountains and the lakes, small and man-made though they may be, and Shanghai boasts the rivers, but neither has all three! This is definitely a city I’d like to spend more time visiting in future, and given its close proximity to Shanghai and Kunshan, and its deep connections to China’s long history, it won’t be long before I’m back there for another round of temple touring, street walking, and museum going. This very matter-of-fact article announces the opening of the first major department store in Shanghai. 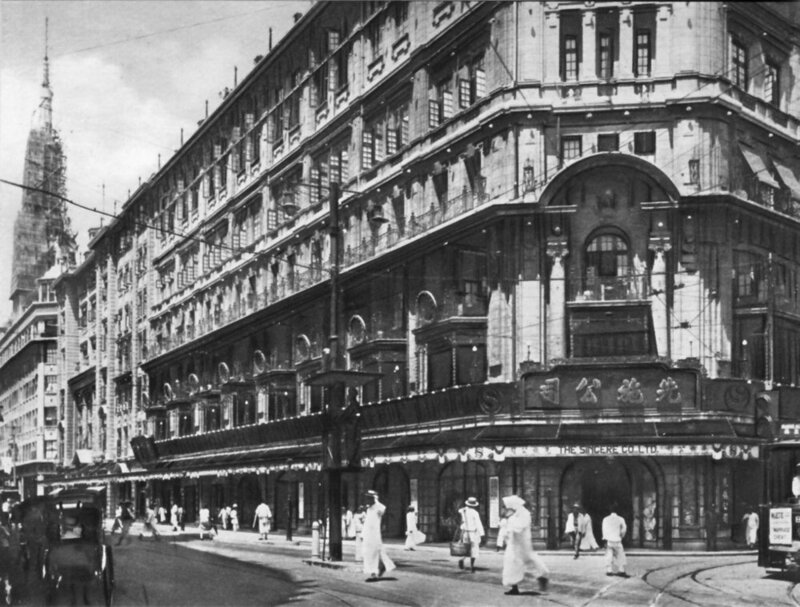 Sincere was one of four department stores to open on Nanjing Road between the 1910s and 1930s. The others were Sun Company, Sun Sun, and Wing On. All of them were owned by Cantonese merchants who had learned about modern department stores while living in Sydney Australia. These families became very wealthy and the department stores helped to transform Chinese commerce in the 20th century. They are still there today. While the article features many fine details about the construction of the building, it is interesting and perhaps telling that no mention is made of the owners, the Ma family from Canton who made a fortune through their business. The splendid departmental store of The Sincere Co., Ld., of Hongkong and Canton will be formally opened for business today. It was really open on Thursday and Friday but only for private inspection. The block which the Company has erected has frontages to Nanking, Chekiang, Kwangse and Tientsin Roads, and covers an area of more than 10.1 mow. These are roughly divided into four sections, or sub-blocks, by roadways sufficiently wide to take vehicular traffic. At the corner of the Nanking and Chekiang Roads is a tower 150 ft. high which will later contain a clock with a reinforced concrete flag pole on top 20 ft. high. The building at the corner of Nanking and Kwangse Roads is divided internally into two, comprising the Sincere Co.’s store and the Hotel, and is the portion which is now opened; the store is four and the hotel five storeys high; this difference in the floor and window levels made it difficult to design a harmonious and fine architectural facade to the Nanking Road and it reflects great credit on the architects, Messrs. Lester, Johnson & Morriss, that such a well-balanced and accurately designed piece of architecture has been erected, a handsome acquisition to the list of fine buildings which Shanghai is gradually possessing. The general construction is a reinforced concrete skeleton with brick and stone filling in; the roofs are flat and of reinforced concrete covered with “Pabco” roofing supplied by Messrs. A. R. Duncan & Co., who also supplied the floor and wall tiles; in the centre of the store is a large “light well” with an ornamental skylight; there are two enclosed concrete staircases to the store, one on the north and the other on the west and thus there is no possibility of people being cut off from exits in case of fire; on the north are two lifts by Messrs. Smith Major & Stevens, supplied and erected by Messrs. Scott. Harding & Co., reducing the fatigue of shopping to a minimum; on the roof are large tea pavilions whence a splendid view of Shanghai is obtained, and even of the Hills except on the dullest days. The store is the largest and most up-to-date Chinese-owned store in Shanghai at which everything from a needle to an elephant (toy) can be obtained. The ground floor has departments for grocery and provisions, wines spirits, liquors, kitchen ware, hard-household supplies, electric goods sports goods, toys, musical instruments, etc. On the third floor are the general offices of the company and the furniture department. The method of doing business will be mainly on the cash basis, but opportunity will be given to householders to run monthly accounts for the grocery and provision department with settlements prompt every month. The hotel, on the east side of the store and entirely cut off from it by a substantial fire-wall, is proof of the growing liking of Chinese for foreign comfort and modern conveniences. The portion of the hotel now open comprises a large and handsome entrance lounge with bar, and billiard tables; a lift takes guests to the upper floors on which are situated the bed-rooms, numbering fifty-two in all; on each floor is ample lavatory accommodation and bath-rooms, fitted with foreign enamelled baths with hot and cold water laid on, while each bed-room has a porcelain wash-basin with hot and cold water, and is heated with a radiator. When the second portion of the premises are opened the bedroom accommodation will be doubled. A novel feature of the whole of the premises is that every portion is connected at various levels and at the roofs, which are all flat, by concrete bridges which preclude any possibility of people being cut off in case of fire. The general external style of the premises is a free English Rennaisance, the walls being faced with blue Ningpo stone to the first floor level and with granite chip cement above carried out by Japanese ; the columns, cornices and dressings being of patent stone. All the premises are fitted with fire hydrants, pumps and modern fire appliances, this work together with the heating, hot and cold water supplies and lavatory arrangements being executed by the Shanghai Waterworks Co. This cartoon, racist by the standards of our own day, appears along with the article reproduced here. 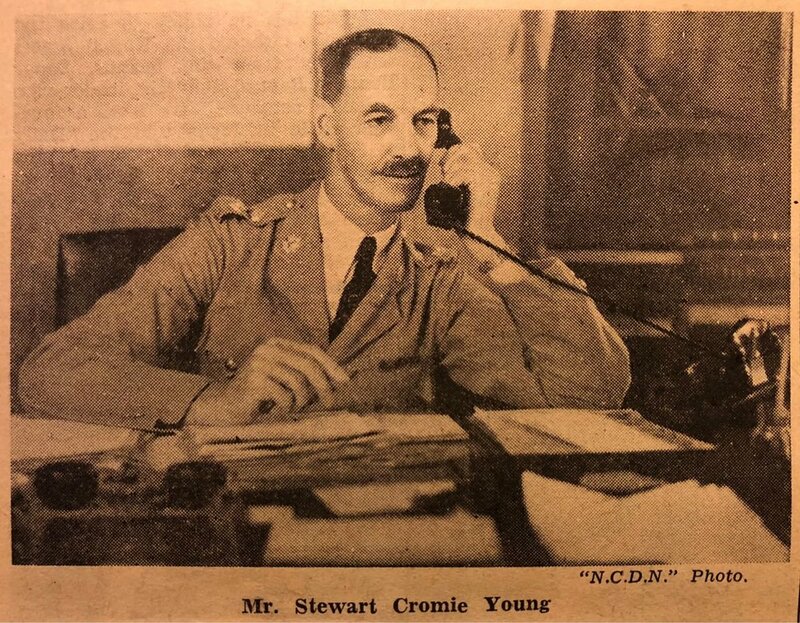 S. C. Young was a policeman from Ireland who arrived in Shanghai in 1904 worked his way methodically up the totem pole of the Shanghai Municipal Police to achieve the highest rank in 1938. I recently published an article about his story in the latest issue of the RAS Journal. The January 28th Incident is shorthand for the war that took place in the Zhabei district of Shanghai (mainly) in January to March, 1932. This article was written by a firsthand observer. This story later appeared in the China Weekly Review in late July. It offers a more detailed account of the origins and aftermath of the May 30th Incident or Movement, including a day-by-day account of events that transpired in the month of June. The killing of several students by settlement police in Shanghai led to many other incidents and movements elsewhere in China all under the rubric of the May 30th Movement. There were numerous strikes and boycotts by merchants, and militarists or warlords also expressed their sympathy for the students who were martyred on May 30. This article published in the Shanghai-based American newspaper China Weekly Review is a thorough and relatively balanced account of the events leading to, during, and following the famous May 30th Incident of 1925. The Incident (known as a Movement in Chinese), occurred when Shanghai Municipal Police in the International Settlement fired on a crowd of student demonstrators and killed several of them. The students were holding demonstrations against Japanese and foreign imperialism in China. The movement was initially sparked by the killing of a Chinese worker by a Japanese factory manager during a strike in Shanghai earlier in the year. This article describes the events of May 30 in some detail, relying both on police reports and on the account of a student demonstrator. The aftermath of the incident is also covered in this article. Highlighted is the growing fear of foreigners in China for their safety amidst a growing national movement against foreign imperialism.